The perfect family. The perfect night. The perfect crime. Will and Karen Jennings are a successful young couple with every reason to celebrate. From modest beginnings they have built the life of their dreams. Will has a thriving medical practice, and stands at the threshold of a great fortune. Karen has designed a magnificent house to shelter them and the five-year-old daughter they love beyond measure. But now they have been targeted by an evil madman and they are about to be tested in a way they could never imagine. 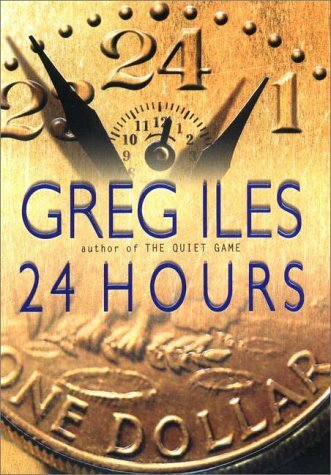 The tight writing style of Iles is perfect for this tense thriller. The plot is sophisticated and riveting, and the pace never lets up for a second, keeping you gripped; sharing the same terror and determination as the Jennings as they get through the longest 24 hours in their lives. There is a sense of urgency throughout made all the more poignant by the fragility of the characters as the story unfolds. It’s a rip-roaring, non-stop roller-coaster ride that constantly batters you from all directions, leaving you uncomfortably disorientated, which only helps intensify the emotional turmoil, and you find yourself feeling hatred and pity in turn for the “bad guys”, humanising them in a way not often attained in a thriller. You also find yourself plunged into the dilemma of “what would I do?” and this also keeps you turning those pages. If you’ve never read Iles, pick this one up and I guarantee, you’ll be promising yourself another of his books very soon. 24 Hours was made into the motion picture Trapped, starring Charlize Theron, Stuart Townsend, Kevin Bacon and Dakota Fanning.